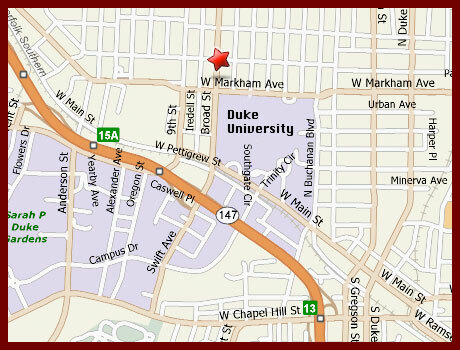 We operate a busy practice in Durham, NC. Our team specializes in treating a variety of health problems with acupuncture, Chinese herbs, hypnosis, Emotional Freedom Techniques (EFT), functional medicine, and dietary counseling. If you suffer from PMS, menstrual problems, menopause, infertility, frequent colds, cough, blood sugar disorders such as reactive hypoglycemia, diabetes, edema, urinary problems, digestive problems such as colitis or irritable bowel syndrome, insomnia, anxiety, chronic pain, auto-immune disease, or any other condition now might be the time to get help. Our clinic has been in operation since 1989, initially in Santa Fe, NM with a subsequent clinic in Durham, NC which was established in 1999. Ken Morehead and Dagmar Ehling merged their existing clinics in 2004 to form Oriental Health Solutions. Fang Cai operated OHS branches in Kaneohe, Hawaii and Belfast, Maine for a period of four years. In 2011 OHS was a finalist in the “Best Holistic Medicine” category and in 2012 OHS was a finalist in the “Best Acupuncture Clinic” category in Durham’s Independent Weekly newspaper. Feel free to contact us if you have questions, would like to book an appointment, or would like to come in for a free 15 min consultation. Our patients get results! We pride ourselves in providing excellent care. This site is funded and operated by Oriental Health Solutions, LLC. For further information please call Oriental Health Solutions at 919-286-9595. Click to download driving dirctions. Your first visit usually takes about 1½ to 2 hours. We will ask you a variety of questions – many you will expect and some will seem unusual or different from what you may have experienced when visiting other health care practitioners. As part of the examination we will check your pulse on your wrist, look at your tongue, and/or may press on certain acupuncture points. Typically, we perform an acupuncture treatment during the first visit unless there are specific reasons or you wish not to. Some patients only get herbs and/or come in for a nutritional consultation. Most of our patients enjoy treatments and find them very relaxing. All needles are sterile and used only one time. You may feel a small prick lasting a couple of seconds when the needle is inserted. At about 90% of the time nothing is felt at all. Once the needle is in place you may not feel anything or it might feel slightly heavy or achy but not typically feel painful. We would like you to understand your treatment and will do our best to explain the process. If this is your first visit to a practitioner of Oriental Medicine, we assume you will have many questions to ask. There are many variations of Oriental medicine – Traditional Chinese Medicine (TCM), Five-Element, Japanese, Vietnamese, and Korean styles, so even if it’s not your first time receiving acupuncture there may be some differences. We practice a variety of styles at OHS: a Japanese style taught by Kiiko Matsumoto, TCM (Traditional Chinese Medicine), Master Tung’s, Richard Tan, Yuan Qi and Classical Acupuncture. All styles are based on the Chinese classics and modern medical pathophysiology. The Japanese style is our primary acupuncture style. It is a very “hands on” approach and is based on palpation of active reflexes on the abdomen (the hara), neck, back and their corresponding treatment points. This system of palpation gives the practitioner and patient immediate feedback on both diagnosis and treatment making the acupuncture visit more succinct and efficient. Our herbal prescribing is done using TCM, Shan Han Lung, and Jing Fang styles as our diagnostic and treatment styles. They are custom-tailored and we find our results are best with combining the best of any of these approaches based on the patient’s presentation. Moxa – an herb (Artemisia vulgaris) that is burned either on a needle or used to warm a certain area or point. Cups – a vacuum is created inside a glass cup and then it is placed on different parts of the body. It may stay in one place or be moved over an area such as your back. Guasha – a form of bodywork using a Chinese porcelain spoon that is massaged over specific body areas. Homework - We often give homework to patients. This might mean massaging certain points, using specific foods for their therapeutic value, or other complaint specific things. This enhances treatments and helps you participate in your healing process. Herbal Formulas – Raw herbs or Granules - Herbal formulas are an important part of successful treatment outcomes with Oriental medicine. We have two large single herb pharmacies, each containing about 250 herbs. We carry the actual raw herbs which are the ones that have been used for thousands of years in China. They include roots, twigs, buds, rhizomes, and other parts of plants. We also carry those same herbs in granule form. Therefore, we can custom-tailor formulas for each patient based on his/her presentation and needs. We only work with suppliers that have stringent quality controls and both types of single herbs carry the “Good Manufacturing Process” (GMP) certification. In addition, our granules are ISO certified, complying with a stringent German certification system. We have had numerous communications with our suppliers to ensure the highest quality of our pharmacy, and are constantly pushing the leading edge in this regard. Prepared Medicines - These are prepared formulas generally in the form of pills, capsules or tinctures. These are manufactured both in China and the US. The distributors we use routinely test their products by independent laboratories for the presence foreign substances, such as heavy metals, pesticides, and pharmaceuticals. All have been certified by “Good Manufacturing Process” (GMP). Prepared medicines cannot be custom-tailored as they have already been made into pills ahead of time, so you may be required to take more than one formula to get the best results. Electro-acupuncture – on rare occasions a battery powered electrical device using low level electricity can be added to the needles usually for treatment of chronic pain. Alpha-Stim – when experiencing electrical therapy, most patients feel strong electrical currents running through their body that can be uncomfortable. In these cases, milliamp stimulators (thousandths of an ampere) have been used. While they have their place in the therapeutic world the Alpha-Stim or microcurrent therapy uses a completely different approach. Microcurrent therapy is in the millionths of an ampere range and generally below our ability to feel the current. The gentle nature of this therapy is nourishing to the tissues and so safe that the European medical community rates it as save as stereo equipment! When using Alpha-Stim microcurrent the focus is on stimulating a healing response, and reduced pain is the result. The impact of microcurrent increases over time as the healing process continues. We also find that the Alpha-Stim device is wonderful for some central nervous complaints, such as depression, anxiety, insomnia, and PTSD from trauma. Its use is completely in harmony with the practice of Oriental Medicine. When needed we may rent a machine to patients so they can treat affected areas at home. Our practice is very busy and we make an effort to stay on time. Please come to the office 5 minutes before your scheduled treatment. This will give you time to get a drink of water, go to the bathroom, or sit for a few minutes and take time to catch your breath. After your initial visit, we may want to see you either every week, every 2 weeks or every 3 weeks depending on the severity of your condition and whether we’re supporting your treatment progress with herbs and/or dietary adjustments. As your condition stabilizes we will phase out treatment or suggest interval treatments such as coming in for a quarterly or annual tune-up. Appointments: All patients are seen on an appointment basis. Please call well in advance so we can reserve time for you. Please be aware that the full treatment fee will be charged for broken appointments unless a 24-hour notice is given. It is the patient’s responsibility to remember an appointment. Reminder calls are made only as a courtesy. Information regarding the Emotional Freedom Techniques (EFT)/hypnosis can be found in the FAQ section. If you have any further questions please feel free to contact us. We look forward to working with you. After many requests of current patients for family members in other parts of the country, we are proud to now offer nutritional phone consultations to patients nationwide. We often find there is a need to answer questions about diet in general or which foods would enhance your well-being using Chinese medical diet therapy. All meal plans and specific food suggestions are custom-tailored. If you are planning to have a baby soon we can offer detailed instructions so that you too can have a baby that looks like those shown on the Healthy Baby Initiative. We’re getting a slew of cute, healthy baby photos! It will be unlikely that these kids will need braces when they’re teens if the diet is followed! After your initial consultation which may last anywhere between 45 min to one hour you will receive various resource materials to help you implement the recommendations. Periodic follow-ups can be scheduled as needed to measure your progress and provide support. We’re used to lots of questions in this area.